Brussels sprouts are little cabbages, which means they can be a bit tough. Braising softens them so that they're nice and tender. But not too tender! Brussels sprouts should have a little bite to them, a bit of crunch. Just not so much that you can't get your teeth through them. 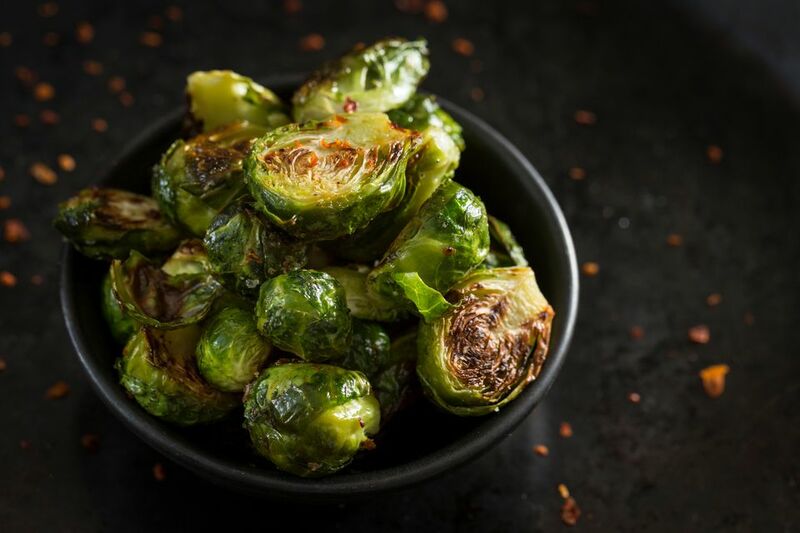 For this recipe, you'll first render some bacon in a skillet, then caramelize the brussels sprouts in that same pan, in the bacon fat, before adding some stock and simmering for a few minutes. But as we said, the goal is tender but still crunchy brussels sprouts. For that reason, when you get to step 3 below, it's a good idea to simmer the sprouts for five minutes and then test one. If it needs longer, give it another five minutes. You're better off focusing on tenderness rather than time, or whether the liquid has reduced by exactly half. It's also good to have some liquid still remaining in the pan to serve as a sauce. But if your brussels are done and you still have a ton of stock in the pan, it will thicken up some when you stir in the butter. And if you want to employ some more powerful culinary magic, you can mix up a tiny cornstarch slurry to thicken it. By tiny, start with about half a teaspoon of cornstarch and mix it up in a teaspoon or so of cold water, and then add the slurry to the simmering sauce. You're not trying to thicken it into mortar, you just want to give the liquid a little bit of body. Otherwise, you can adjust the amount of liquid you use the next time you make it. Pan width and thicknesses vary so much, to say nothing of how hot the burners on your stovetop get, that it's impossible to prescribe an exact amount of liquid that will work for everyone. Cooking! It's a science, but it's also an art. For a vegetarian version: Omit the bacon and sauté the brussels sprouts in butter instead. And substitute vegetable stock for the chicken stock. For a vegan version: Make it the vegetarian way only leave out the butter, too, and use olive oil instead. Add the bacon to a cold sauté pan. Heat slowly over low heat, stirring frequently, until the fat starts to render and the meat turns golden brown and crispy but not burnt. Add the brussels sprouts cut-side down and sauté over medium-high heat for a few minutes, or until they're slightly browned. This caramelization will add a lot of flavor to the recipe. Then use a pair of tongs to flip them over so that they're face up. Add the stock, bring to a boil, then lower to a simmer and cook until the liquid is reduced by about half (5 to 10 minutes), stirring occasionally. Stir in the butter, season with Kosher salt and lemon juice and serve right away.